Our area skill has empowered us to think of a fabulous accumulation of Artificial Grass for Hotels. The furnished grass is made with the assistance of premium quality manufactured plants, grass and blooms under the direction of our sellers' accomplished experts. Accessible in different lengths, the offered grass is exceptionally utilized as a part of recreational zones, arrangements, outsides or inner parts to improve and decorate the surroundings and make them look greener. Besides, this grass can be profited by our regarded customers from us at sensible cost. 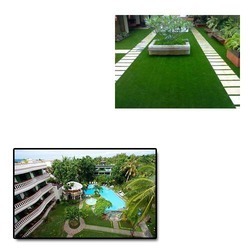 Looking for Artificial Grass for Hotels ?